Can we talk about comfort zones for a second? 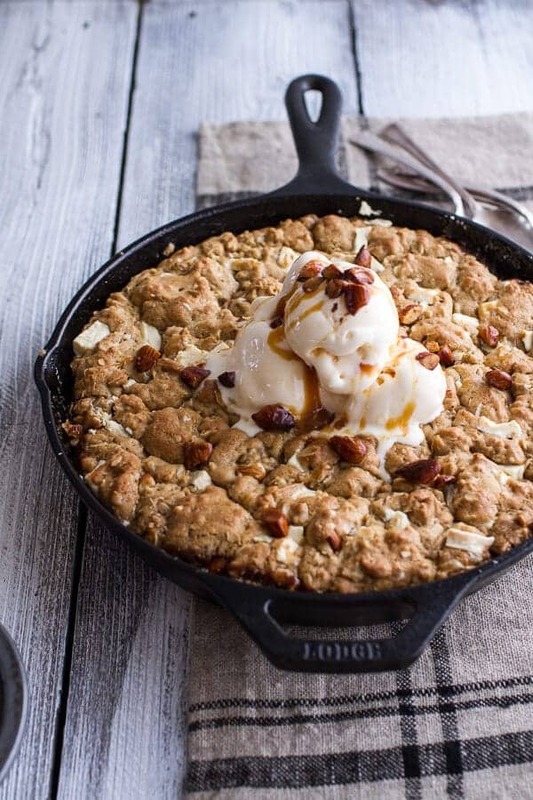 Because this here – Caramelized Peach + White Chocolate Oatmeal Skillet Cookie Pie – is so completely out of my comfort zone. It’s completely sweet, but has nothing to do with chocolate (well at least not semi sweet or dark anyway) and is full of fruit. If you have been reading for any amount of time than you know I am all about chocolate. Especially chocolate that has nothing to do with fruit. I just do not like that combo (unless bananas, dates or maybe, maybe a caramel apple). Things with fruit and white chocolate as the stars are just a foreign concept to me. Sure, I have made some fruit desserts that I love. I mean, I still dream about this crumble, this pie, this dump bake and these caramel apples (LOVE THESE). Normally though, when it comes to dessert I really just stick to chocolate. I pretty much have zero interest in venturing outside my little chocolate dessert bubble. I know, so totally lame. On occasion though, I want to do something different and that is when recipes like this one happen. And you know what? Every time they do happen I wonder why I don’t make non-chocolate sweet things more often. Hopefully, I am beginning to see the light. Probably not, but I am hopeful. Right now is a weird time. We are at the end of summer when all the fruits and vegetables are at their best. But it’s also that time when people begin to think about fall. Fall baking, cozy foods and pumpkin everything. This in-between period can be kind of hard for me in deciding what to make. Summer fruit or cozy fall chocolate? For now I am sticking with summer. I am nowhere near ready for pumpkin anything yet. Check back with me a few weeks into September and… pretty sure I will be more than ready for pumpkin by then. Currently, I am all about eating up every last bit of summer. Like give me all the berries, all the stone fruits, all the melons, all the tomatoes, corn, zucchini and everything in-between. This means today is peach day! Well, actually I kind of used a mix of nectarines and peaches since I had both on hand and also love nectarines. You can use either one, or do what I did and just use both. 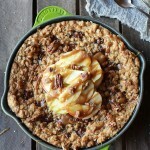 This skillet cookie/pie you see here, was actually inspired by anther favorite dessert I made last fall. That cookie involved chocolate, caramel and apples and I loved it so much. I have been dying to do another skillet cookie ever since, so I thought why not try one with peaches. This time I made it more pie-like with peaches on the bottom an cookie on the top. I was going to put cookie on the bottom too, but then I realized that would mean having to scoop out the caramelized peaches from the skillet and onto a plate. I know this seems like no big deal, but it was just not an extra step I wanted to take. Things that are all warm and caramely should just stay put. It’s easier that way. Trust me. So the peaches stay on the bottom in the sweet self made caramel sauce and the oatmeal cookie studded with white chocolate gets baked right on top. I guess it is kind of like a cookie crumble, but I liked the sound of pie. Pie aways sounds pretty delicious. In true Gerard family fashion, I just added a heck of a lot of sweet vanilla ice cream (an absolute must with this), handed everyone some spoons and said dig in. Who needs bowls? It just means more dishes to wash anyway, and we all know that eating a warm cookie straight from its baking dish is better than anything. This dish is perfect for these late summer days that can sometimes have a little bit of a chill to them. It’s the perfect mix of hot cookie and cold ice cream. It’s crazy easy, crazy delicious and all you have to do is make it. Ok, you obviously do not HAVE to, but I really hope you will. 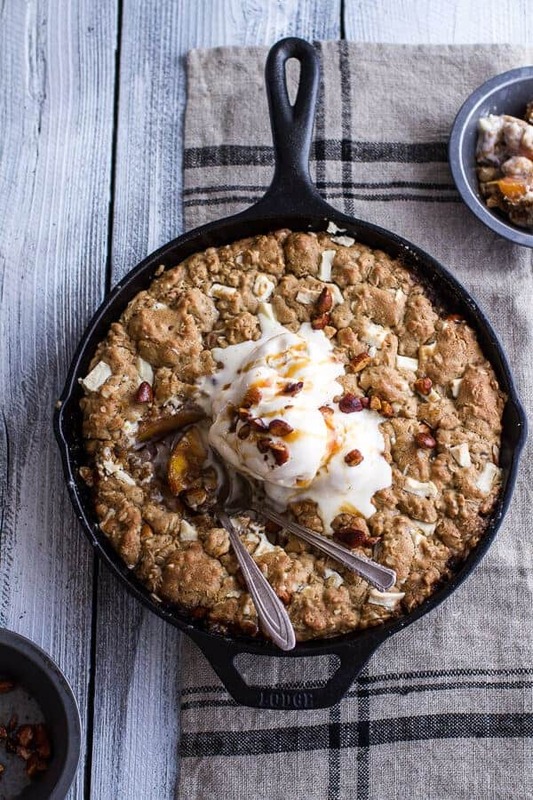 Caramelized Peach and Whole Wheat White Chocolate Oatmeal Skillet Cookie Pie. This white oatmeal skillet is completely sweet, but has nothing to do with chocolate and is full of scrumptious fruit. In a large mixing bowl or bowl of a stand mixer, add the oatmeal, white whole wheat flour, brown sugar, baking soda, salt, melted coconut oil, eggs and 2 teaspoons vanilla. Beat until combined and the dough holds together (the dough will seem oily, this is good). Mix in the almonds and about 1 cup of the white chocolate. Sprinkle the dough directly over the peaches and or nectarines. Do not worry if there are a few patches where there is no cookie dough. It does not have to be perfect, the dough will fill out as it bakes. Bake for about 20-25 minutes, just do not over bake. Underdone is always better in my opinion. Remove from the oven and let sit 5 minutes. Top with vanilla ice cream and the reserved butter/caramel sauce from caramelizing the peaches. Enjoy! 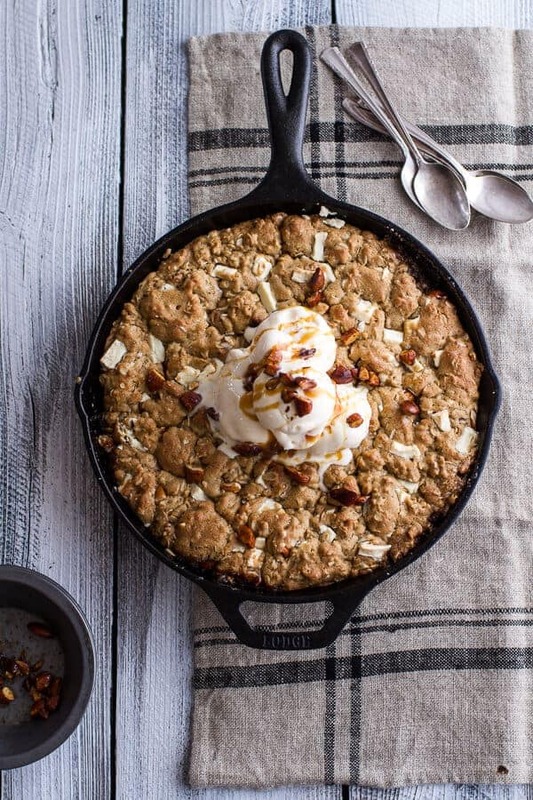 You could have just stopped at the caramelized peaches and I would have been good…but this skillet cookie is insane. I can only imagine how quickly it would be devoured hot out of the oven..Your pictures are gorgeous. Ha, I am with caramelized peaches are so good! This might just be my new favourite frying pan cookie. I have a bit of a thing for peaches at the moment anyway but right now I am dying to make this to recreate your dig in thing. Haha! You can also just transfer the peaches to a baking dish and place the cookie over the peaches, then bake. You do not have to have a skillet. Thanks so much and I hope you love this! I am with ya. I usually am GUNG HO for anything chocolate, and any dessert without it makes me nervous. 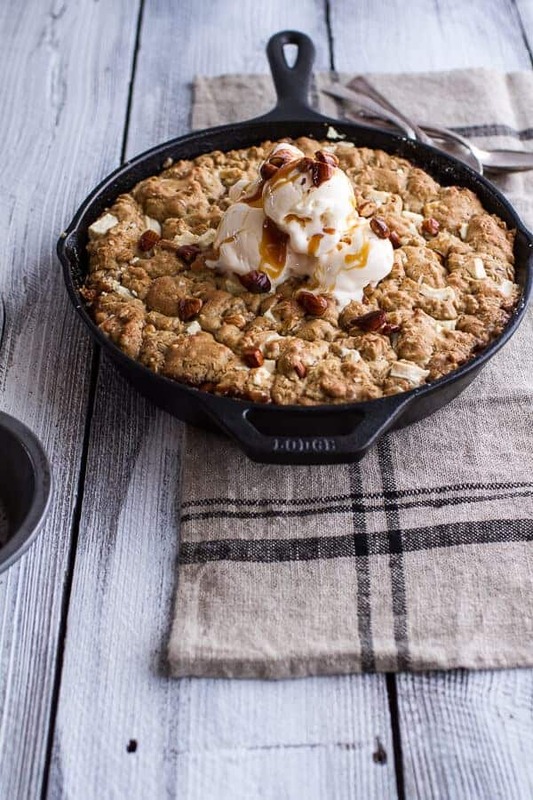 How-ev-er, I have been looking for an excuse to buy a skillet…so I am alll about this! Pinning! OMG. How do you not have a skillet? Buy because you will use it every single day. Seriously, you will! 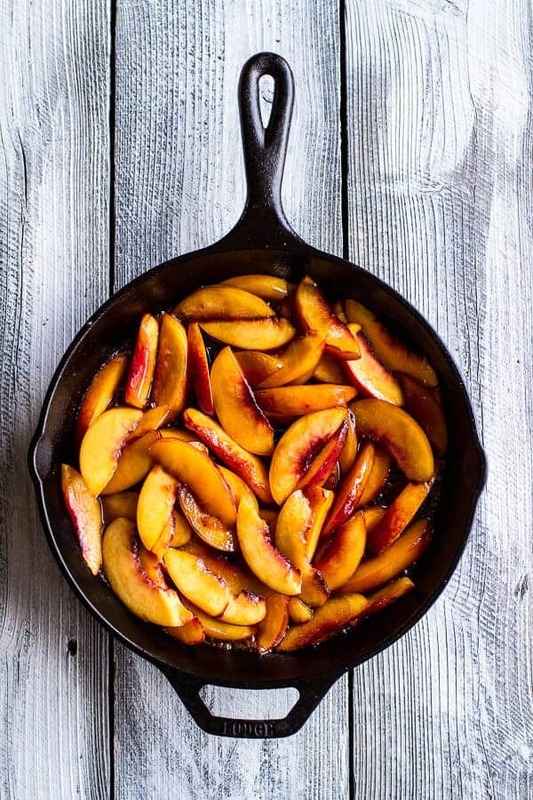 Since peaches are my favorite fruit and I have over 50 pounds getting ripe as I write this…. This might just be one I have to try. I am not a fan of white chocolate but my husband loves it and our daughter in law can’t eat regular chocolate. It sure looks yummy!!! Thanks Charlotte! I would do half the cookies with white chocolate and the half half with either more nuts, butterscotch chips, peanut butter chips or chocolate chips. Whatever you love! Any recipe with the words pie AND cookie in it has to be amaazing. Looks great! Man, you are good– it’s 6 am on 26 of august, and you already have a post out. Love it! this is a perfect recipe– i usually make a huge cookie loaded with all kind of goodies ( more like cookie pizza), but this is a great variation! Hubby will be happy! And that is a problem?? I am NOT ready for fall either!!! Way to early! I still want all the peaches, tomatoes, and corn that summer can offer me. This looks delicious Tieghan!! Still have yet to make a skillet cookie. This looks amazing Tieghan! 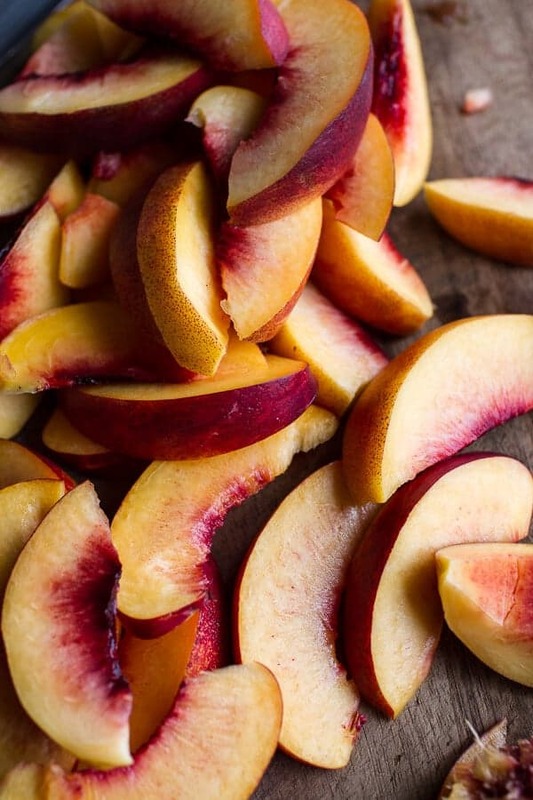 I have some huge nectarines that need to be eaten and this recipe is calling for them. Need to get a smaller iron skillet though, what size is the one you used? A 10″ or 12″? I used a 10 inch, but 12 inch also works. Thanks Kathy and I hope you love this! I am with ya! Deserts usually have to have chocolate, or peanut butter to make me happy. But I would definitely be happy with this! oh man oh man, can i have an entire one of these for breakfast??? Tieghan, you are a gosh darn genius. I mean… can I just give you an award for the most delicious flavor combinations in food ever?! This looks absolutely glorious. Oh, and I’m right there with you on the chocolate thing! I kept saying the same thing when I was making my Maple Bourbon Brown Butter Pie! If there’s no chocolate, I’m typically not into desserts, but there’s just something about peaches that apparently have made me a believer in all things fruity and amazing. So glad we are on the same page about chocolate! This looks luscious, especially topped with ice cream like that. (Always yes to the ice cream! 😉 ) Great use for peaches! Whoooa…I’ve been fixating on cobblers all summer, but this looks like a *fantastic* twist on more traditional fruit desserts! Love the idea of a cookie on top – so creative! I’m so glad you went out of your comfort zone for this recipe because it looks absolutely fabulous. Way to be, sister, way to be! This looks UNREAL. Can’t wait to try it! I’m a chocolate lover too… and not usually big on white chocolate. And I love fruit desserts, but not usually peaches. Yet, I’m drooling looking at the photos of this recipe. I’m glad you stepped out of your comfort zone on this one. I think you’ve got a winner! Our kids are coming in this weekend and I know this recipe will be a highlight…thank you! Looks delicious. What temp do you bake it at? Oops, So sorry, it is 350 degrees F. Hope you love these! Oh My Goodness. I’m starting to miss summer but this recipe would help create a cozy transition. 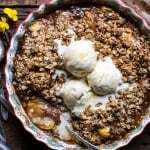 I love skillet dishes, especially fruit crumbles. 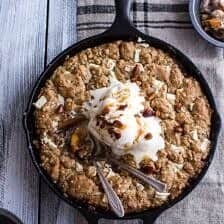 I’m experimenting with a blueberry cobbler skillet recipe and am totally on the same page with this amazing looking recipe! Thanks Matt! The blueberry cobbler skillet sounds awesome! I love these skillet deserts, they are great for when we go camping. They are perfect for camping! Thanks Marci! I’m the exact same way; dessert for me means chocolate, and even though I have made a few desserts without chocolate before that I actually love, I don’t think I’ll ever stop favoring chocolate over the rest. 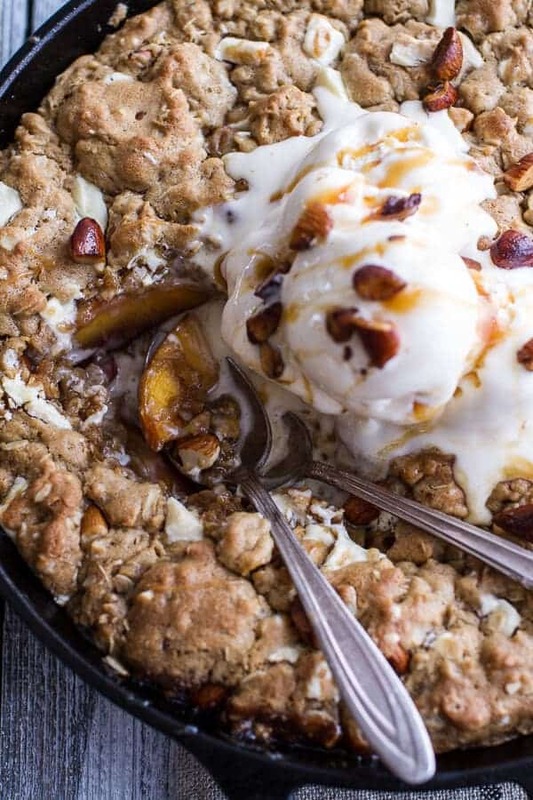 But this cookie pie looks incredible and I love peachy crumble-type desserts too. YUM! Haha, you sound just like me! Gorgeous, gorgeous, gorgeous! Also.. I think I have those dish towels. Just saying. Beautiful work! 🙂 Looks and sound delish. THANK YOU! 🙂 Hope you had a great day! This is out of my comfort zone too, but in the best way possible. YESSSSSSSSSSS!!!! Haha, thanks! Hope you had a great Tuesday! Looks and sounds just amazing! Can’t wait to try it for myself! Oh my gosh this is so gorgeous. You seriously make me want to eat peaches! Can’t wait to make this! First day of school breakfast for my three tomorrow! Thanks Tieghan. Haha! That is awesome! Thanks and hope you guys all love this cookie! Please pass me a spoon because I want to dig into this pie!! Please keep sticking with summer Tieghan, I love everything you make and this cookie pie is no exception. Love all you put into this! Whoa! This is pure genius! Oh, no, I’m pretty sure I have to make this! Pinned! I’m not ready for fall or pumpkin either. Bring on peach everything!!! First of all can I just say that this looks absolutely amazing… I’m drooling just looking at my screen! Do you think this would work with dark chocolate rather than white though? My family is a strictly dark or nothing kind of group, but I don’t know if I can stand not making this…! Well, the whole wheat certainly made me think of it being healthy so that can’t be a bad thing, right? This looks amazing! I cannot wait to try it, although I don’t have whole wheat flour or coconut oil so you know what that means…butter here we come. Pinned! I’m a little confused, the directions say you need 4/5 peaches or nectarines but the instructions just direct you for what to do with 2 peaches/nectarines. Are you supposed to slice up all the peaches in the beginning in caramelize or just 2 as the directions state? I’m hoping to serve this at a ladies’ cocktail hour tomorrow and I’m excited! Oops, I am so sorry! 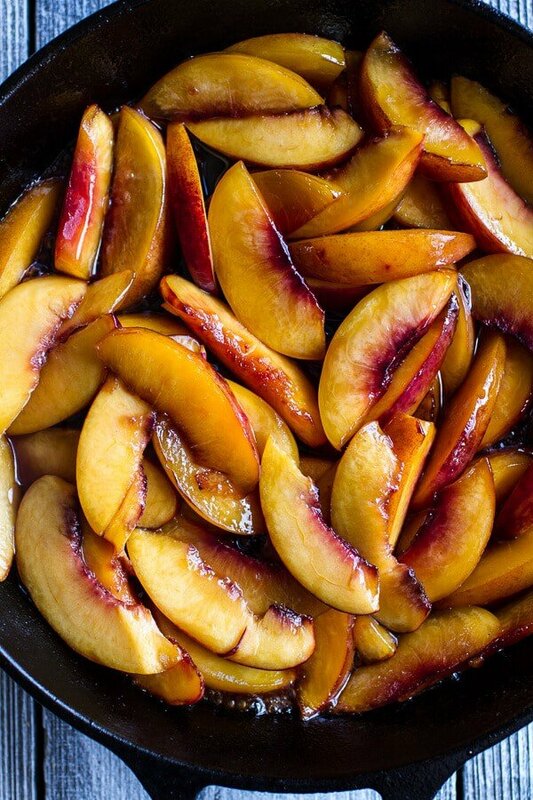 you need 4 to 5 peaches (depending on their size) and you need to slice them all at once. I have fixed the recipe, so hopefully it will make sense now. Thanks for pointing that out and I hope you love this! Thank you! I am so excited to make this and my friends are so excited to eat it! OMG, I’m like stalking your blog. LOL! This looks freakin’ amazing! I’m so sad peaches aren’t available. I’m gonna make this with apples.. looks phenomenal. Thanks for sharing. Yeah!! Thank you so much! Apples will be delicious! How am I just finding this recipe now? 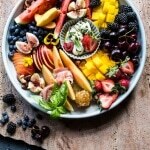 I want to make this this weekend (because I’m pregnant and I want the whole thing) but peaches are sadly not in season. Could I use plums or apples? Would frozen peaches work? I think any fruit would work great!! Frozen peach too! Thanks Laura! The post looks great!! As I cannot eat any wheat or wheat products what would you suggest as a substitute? There are few brown no wheat flours. I do add Xanthan gum where needed, but maybe it isn’t quite so important in this case as the dish remains contained and would be a mixture which is more friable. Look forward to your thoughts on this one, lovely recipe! HI! I would use whatever flours/blend you typically use in baking. I think that will give you the best result you will enjoy! Let me know if you have other questions. THANKS! This looks to die for! I am craving something peachy… Peaches aren’t quite in season yet, can I make it using frozen? Hi Ashley! Yes, frozen peaches will work great! Let me know if you have any other questions and I hope you love this! Thanks! ? 2. Could you sub the coconut oil with something else? Are apples a worthy substitute? please say yes!